First Time Screen Printing Shirts! 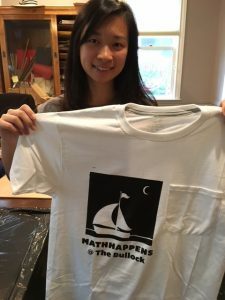 Part of getting ready for MathHappens @ The Bullock on May 6th involves having T-shirts we can wear before, during, and after the event; before to get the word out, during so event staff can be identifiable, and after to have a souvenir from the event. 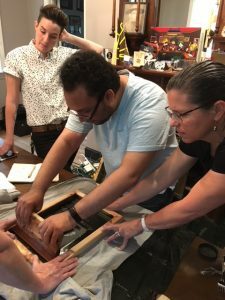 Our friend, Alex Morrison, brought a couple screens along with ink, while Abdul gathered a sample of differently colored shirts so we could see what shirt matched best with the screen print. We liked the gray shirt…and the blue…and the white. It’s going to be a tough choice! Screen printing requires some team work! The screen looks super shiny as Dr. Austin is lifting it up. Abdulkarim lifting the screen to reveal his work. 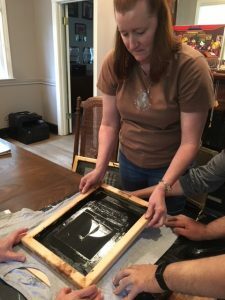 To make a shirt, you place the screen on the shirt so the design goes where you want, put a small amount of ink across the top of the screen, and then you drag the ink across with a squeegee. Once you have covered the whole surface of the design, you can pick up the screen and admire your work. Lastly, let the shirt dry for about 15 minutes and then throw it into the dryer to finalize your shirt. 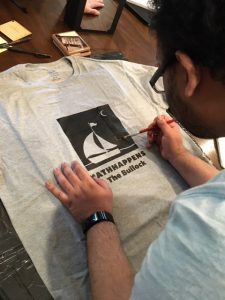 If you haven’t made your own shirt yet, you have got to try! It’s an awesome experience. Joshue fixes any inkless spots with a paintbrush. Michelle is excited to show off her shirt! We think math is fun!